David Allgood uses a trail adapted for persons with disabilities to view a scenic overlook of the Green River at Mammoth Cave National Park in Cave City, Ky. National Park Service accessibility chief Jeremy Buzzell says nine parks across the U.S. have received more than $10 million in federal funding to design and build accessibility projects as examples for other parks. CAVE CITY, Ky. – David Allgood and Tom Stokes glide up a slight incline to the wooden platform overlooking the Green River at Mammoth Cave National Park. From there, they watch through a glass panel as the Kentucky park’s lone ferry carries a Jeep across the water below. The longtime friends turn their wheelchairs and roll toward the recently improved Echo River Spring Trail, which is wide enough for them to travel side-by-side. Accompanied by the gurgling water and chirping birds, they chat quietly about the trail and the thought that went into the view unobstructed by railings. 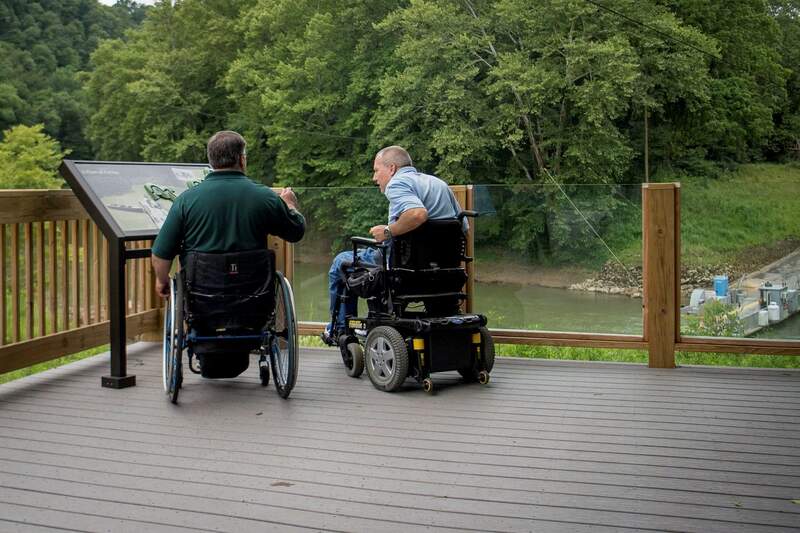 David Allgood and Tom Stokes overlook the Green River from a trail adapted for persons with disabilities at Mammoth Cave National Park in Cave City, Ky. National Park Service accessibility chief Jeremy Buzzell says nine parks across the U.S. have received more than $10 million in federal funding to design and build accessibility projects as examples for other parks. The upgraded trail reopened earlier this year after a $1.1 million transformation from a rolling, rutted gravel footpath to an 8-foot-wide concrete and wood path with little slope. New exhibits include Braille and invite visitors to experience them by touch to make them more meaningful to the visually or cognitively impaired. The Mammoth Cave project is an early step in a coordinated push by the National Park Service to improve and increase accessibility for people with disabilities. The nationwide effort, launched in 2015 with federal grant money, was aimed at increasing the diversity of park visitors. Nine parks have received more than $10 million in federal funding to design and build projects as examples for other parks as they work toward making trails, buildings, waterways and camping more accessible, said Jeremy Buzzell, chief of the accessibility and housing program for the National Park Service. A project at Klondike Gold Rush National Historical Park in Alaska focused on making historic buildings more accessible also is complete, and four other parks have projects in the works. Klondike officials gutted the interior of the park museum in a railway building dating to 1900 and redesigned it to be more accessible. Before renovations, the dimly lit museum consisted primarily of displays best viewed from a standing position, visual information specialist Kira Pontius said. Now the park has interactive exhibits, displays are at a better height for people in wheelchairs and many have small models that visitors can touch with their hands, Pontius said. Visitors also can use audio devices that describe and give background on every display. Pontius said the changes have improved the park experience for everyone. “We have a museum that is much more modern. It’s lighter. It really tells the story, beginning to end, of the gold rush,” she said. 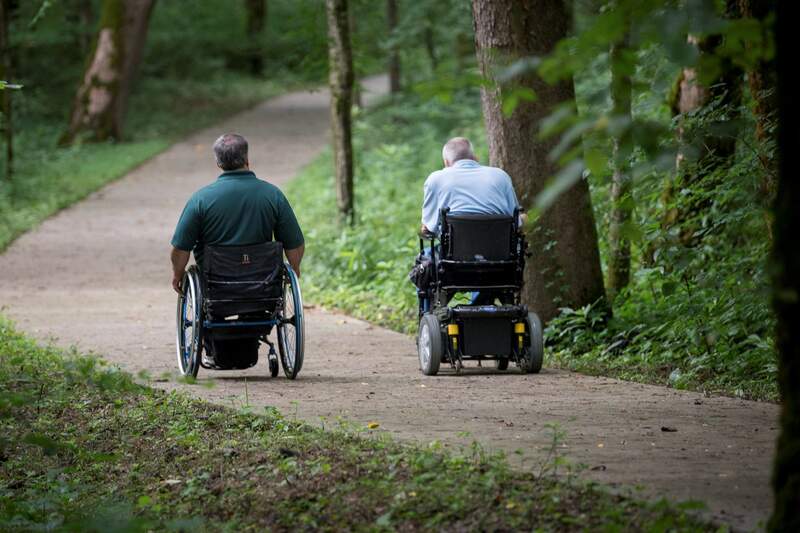 David Allgood and Tom Stokes use a trail adapted for persons with disabilities at Mammoth Cave National Park in Cave City, Ky. National Park Service accessibility chief Jeremy Buzzell says nine parks across the U.S. have received more than $10 million in federal funding to design and build accessibility projects as examples for other parks. The director of National Center on Accessibility in Bloomington, Indiana, said parks should highlight their improvements for the nearly 20 percent of Americans who have a disability. “If you take the time to provide these opportunities, then shout it from the mountaintop, essentially, to let people know, because a lot of times people just assume they can’t do something and choose not to go,” Sherrill York said. The center gave Mammoth Cave officials guidance on their changes and reviewed their designs, said Dave Wyrick, chief of interpretation and visitor services at the park. 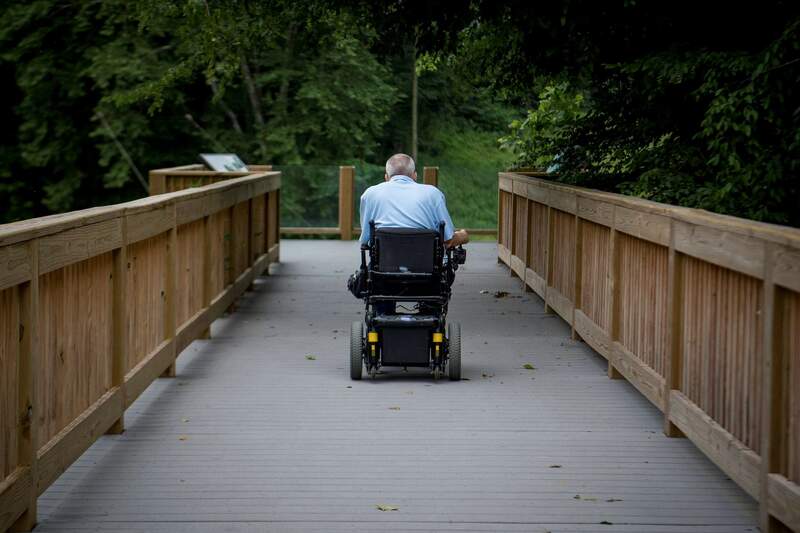 The Echo River Spring Trail is the second above-ground trail at the park to be made accessible to wheelchair users, but it’s the first all-access trail for those with other types of disabilities. The park also offers an accessible cave tour. “We just wanted a universal trail that talked about Mammoth Cave and how it was formed, the springs and things, that everybody could experience,” he said. Allgood and Stokes, who know each other through a disability resource center in Louisville, traveled about 90 miles south to check out the trail, which has added picnic tables that allow them to sit comfortably on the sides instead of awkwardly at either end. Allgood said he’s seen accessibility improve over the 36 years he has used a wheelchair but knows there’s a long way to go. He said he visited the trail before the park started working on it and was only able to travel about 150 feet before he was forced to turn back. “It’s fantastic what Mammoth Cave and the National Park System are doing to make it accessible for those of us with disabilities and mobility impairments, because now we’re welcome to come and actually see aspects of the park that we were never able to do before,” he said.